Lightweight, easily transported - perfect. 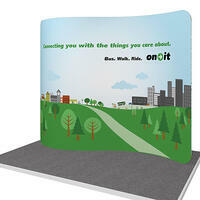 Fabric Displays are becoming a popular option for portable trade show displays. As some of the lightest full-size displays on the market, these systems combine a fabric graphic stretched over a collapsible frame. 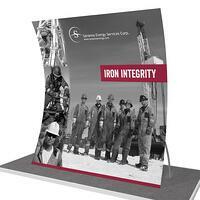 Their weight and compact packaging makes Fabric Displays extremely cost efficient for shipping. Over the years, there have been vast improvements in image resolution quality, wrinkle-resistance, and the washability of the fabric prints. Dye-sublimation prints, on our thoroughly vetted selection of tension fabrics, capture true colour and clarity. With heat infusing your design into the fabric at the molecular level, it remains supple and ideal to stretch over the display hardware. 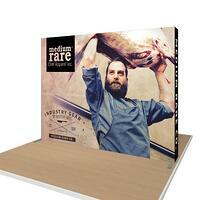 We carry a variety of sizes and shapes, including Table Top sizes, to fit your branding needs. We carry a variety of sizes and shapes to fit your brand needs. 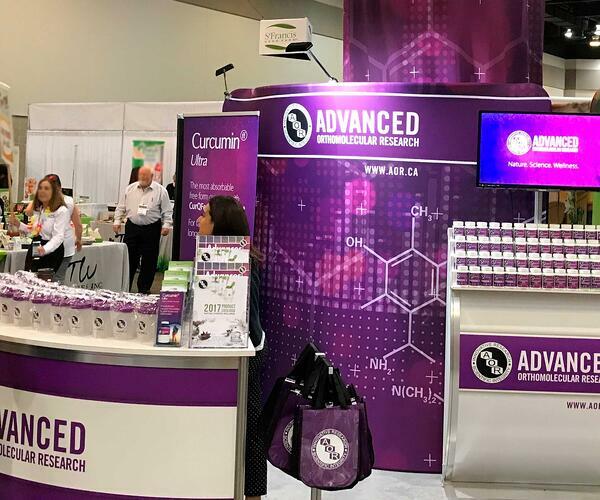 The Wave Tube Curved frame creates an overall effect that is very similar to a Pop-Up display, with the advantages of a lighter system. 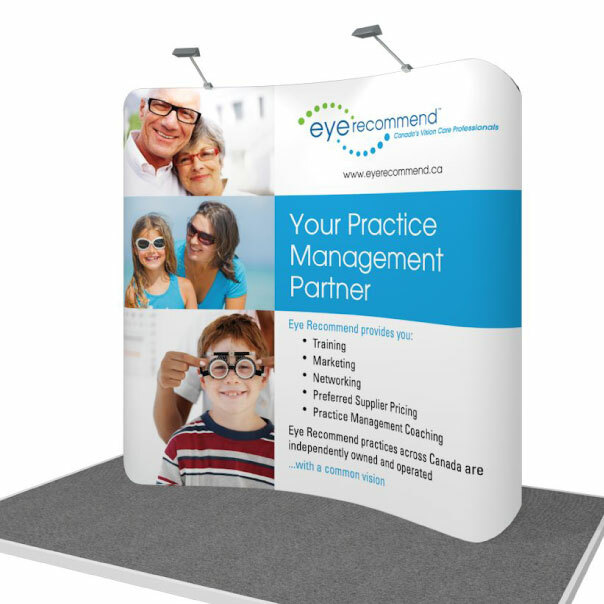 Available in 8ft, 10ft and 20ft wide frames, as well as Table Top sizes, the Curved Wave Tube is a great solution for any booth space. The Wave Tube Straight is perfect when you need your display to take up as little space as possible. 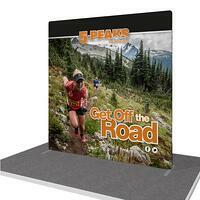 In fact, excluding the slim feet in the bottom corners, this display takes up only 2″ of depth in your booth. This is available in 8ft, 10ft and 20ft wide frames, as well as custom sizes. The Wave Tube Serpentine frame creates an “S” shaped footprint, creating a look that is unlike most other display on the show floor. Despite its unique shape, this display is just as easy to set up as any other Wave Tube, and is available in 10ft and 20ft widths. 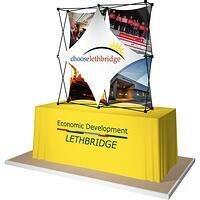 This lightweight display requires no tools and is available in straight or curved 8ft, 10ft or 20ft configurations. The Hop-Up stretch fabric graphic is a continuous panel printed to a durable, wrinkle-resistant polyester. The graphic remains attached to the accordion style frame with velcro. Setup is as simple as popping the frame open, fastening the stability hooks, and walking away! The Milan is a curved fabric system with many configurations and various sizes. The components connect together with a simple lock system that requires no tools. A single, high-quality tension fabric graphic pockets around the frame and zips closed. Accessories are available to give each Milan system it's own unique look! Trade Wind displays are very lightweight, consisting of an aluminum accordion style Pop Up frame and multiple tension fabric panels. They are available in 8ft, 10ft and 20ft, and Table Top configurations. 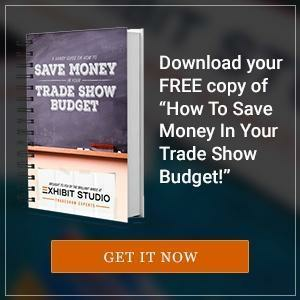 Depending on design of the fabric panels, the booth never needs to be set up the same way twice! 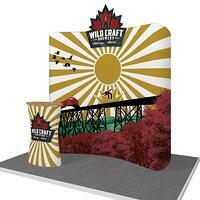 And, add shelving for product display, lights and a podium to complete your booth space. Flying banners make for excellent signage, either indoors or outside. With a lightweight fabric graphic (double- or single-sided print) pocketed over a telescoping pole, they connect to either a ground stake or weighted cross-base (as shown). 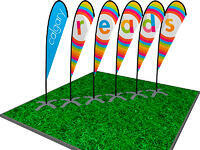 Our line are available in a variety of flag shapes and range from 7′ to 17′ tall. 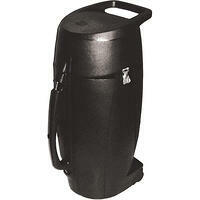 They are easy to setup and pack into a portable canvas carry bag. A perfect complement to your fabric display, our Wave Tube podium is light weight and won’t overwhelm your shipping costs. 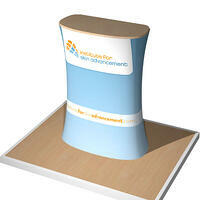 If you need more storage space, consider one of our many other podium options. 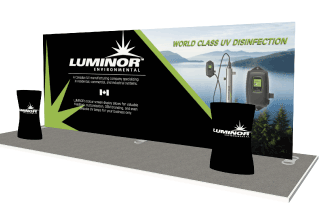 Be sure your beautiful new fabric display is seen at your next event, no matter what the exhibit hall lighting is like, by adding optional lights to your display. With most lighting options available in LED, there’s no risk of causing light damage to the fabric. 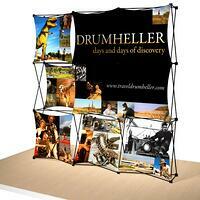 In keeping with the features of a lightweight display, most of our fabric displays ship in a soft-sided carry bag. When your show schedule requires more rugged transport protect your fabric display with an upgrade to one of our durable, molded plastic shipping cases. Interested in our fabric options?